You will find here all technical terms, and other concepts used on the platform, and a short definition of their meaning. An account gathers a user information, like the nickname, email, password, communication opt-ins etc. The expected number of participants in a tournament. Is only an informative value, and can be changed at any time. The Toornament API is a set of functions and procedures for developers to access features and data of the platform. The arrival method is used to distribute participants in the groups when they arrive in the stage. A bracket represents a type of competition in which the outcome of a match (a win or a loss) determines where the participants go next. Matches in a bracket are therefore connected between them and are often represented as a tree leading to a final match to determine the winner. Bracket Groups are groups each containing a small bracket that involves a reduced number of participants. Participants don't move from one group to another, they keep playing in the same group. A bye refers to an organizer scheduling a participant to not participate in a given round of competition, due to one of several circumstances (previously forfeited opponent, uneven number of participants, etc.). A bye may grant a specific number of points. The check-in is a feature that allows participants to confirm their presence to a tournament, right before it starts. Is said of a match or tournament that is over, with a final result set. Custom fields are special fields that an organizer can choose to add to the participants and registrations of a tournament to gather information about them (like birthdate, address, twitter profile, etc.). When the tournament involves teams, there can be different custom fields for the teams and for the players. The departure method is used to re-assign participants from a stage to another one. The "mirror" method reproduces the same method used in the arrival. On Toornament, a discipline is simply the video game on which a tournament is organized. A double elimination stage is a bracket in which participants must lose twice to be eliminated. The stage is divided into two brackets: a winners' bracket and a losers' bracket. The winners' bracket is a single elimination bracket that only involves participants that have never lost. The losers' bracket only involves participants that have lost once. At the end, a grand final is played between the winners of both brackets. A tournament is in a draft status until you decide to publish it, allowing you to effectively run a private tournament. You may duplicate one of your tournaments to create a copy of it, with the same settings. If a participant is disqualified or did not show up for a game or a match, the organizer can declare him Forfeit. This automatically gives the opponent a win, and can induce negative points if set up this way. A game, also called match set, is a subset of a match that describes a part of this match with their own result and score (like the sets in a tennis match). A group represents a portion of a stage that usually involves only a subset of the participants. Most of the time, groups can be played simultaneously because they involve different participants (like the groups in the first stage of the Football World Cup). A league is a stage where all participants play against one another once (or twice in case of a double robin). After all matches are played, a final ranking is calculated (like in the national Football Leagues). The match lobby is a discussion feature tied to each match of a tournament for participants of the match and admins to discuss things privately. The loser bracket is the part of a double elimination bracket where participants play after having lost a match. Losing a match in the loser bracket means being eliminated. A match is when participants fight each other in a stage (two participants in a duel match, two or more in a FFA match). Its result will determine the outcome (points earned, elimination, etc.). It may be composed of games. Notes are chunks of information written on a match to give information about it. Two kinds are available: public or private, depending on whether you want everyone to be able to read it, or only the admins of a tournament. An open tournament is a tournament with open registrations, meaning people can apply for registration in the tournament to participate in it. An organizer is the person organizing a tournament, and also the name of the panel that is used on Toornament to create and manage the tournaments. A participant is considered outgoing when he exits a stage with a rank, so he can easily be placed in the next stage. 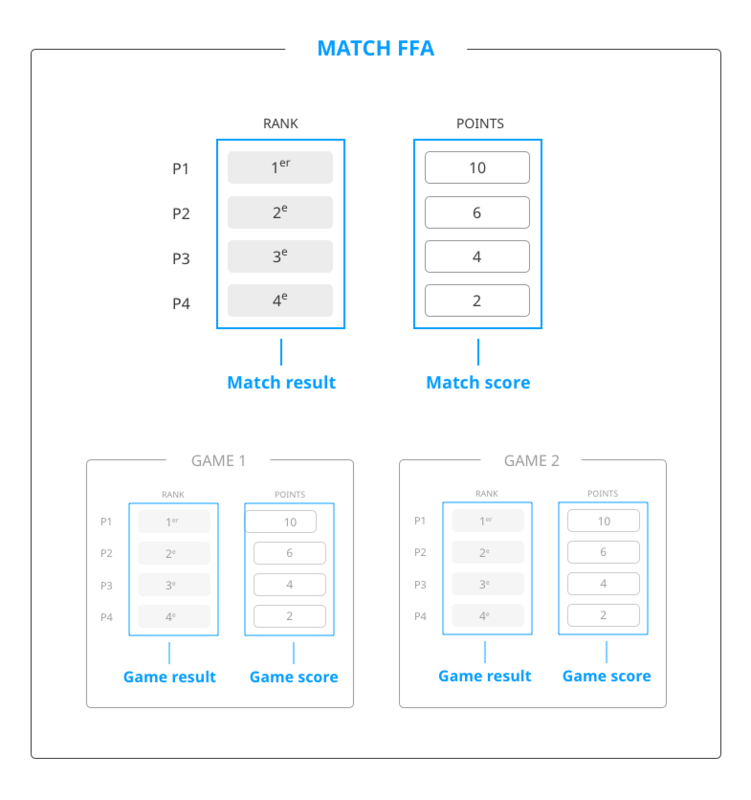 The pairing is how participants are paired to play matches (or more than paired in case of FFA matches with 2+ participants). It is used to determine opponents in matches, thanks to their seed: Player#1 vs. Player#8, Player#2 vs. Player#7 etc. You may customize the pairing of a stage if you need to change the order of the matches for example. A participant is either a player or a team of players in a single tournament, depending on the type of the tournament (individual or team-based). In the case of a player taking part in several tournaments, he will be represented by one distinctive participant in each tournament. Is said of a match that has not started yet, but is ready to be played. The permissions are the way for an organizer to give rights to his admins over a tournament. The placement is how participants are distributed in the stages of a tournament. It is used to determine the seed of a participant, the group in which a participant will play, or its initial position in a bracket. The platform is the video game system on which a tournament is played (PC, console [PS4, Xbox etc.] or mobile). A tournament can be organized on several platforms at once (cross-platform). Points are earned by participants after a match. There are several different ways to award points, depending on the score or results of the games. Points are the default value to determine the ranking of a stage. Position of a participant is determined from its rank, but where several participants may have the same rank, a position can not be shared. It is used to display the ranking, and even if tiebreakers do not separate participants' ranks, their positions will always be different. Participant ranks are determined from their points and the eventual tiebreakers configured on the stage. A same rank may be shared by several participants if a tie is not broken. The registration is the process through which a player or team has to go in order to participate in a tournament. A registration has to be validated by the tournament organizer.. If enabled by the organizer, participants can report their results and scores after having played a match. The term report refers to both the action and object that is transmitted to the tournament. The result of a game or match is the "Win / Draw / Loss" or "Forfeit" value attributed to participants. It's the essential condition to a match being completed. It may be completed with a score. A round-robin stage is a kind of stage where each participant meets all other participants in turn. There are two stages of this kind on Toornament: Round-robin groups and leagues. Such a stage can be configured as Single-robin (participants meet once) or Double-robin (participants meet twice). Good examples of round-robin systems are the first stage of the Football World Cup, and all national football leagues. A round is a set of matches that can be played simultaneously (meaning no participants may appear twice in a round). Is said of a match or tournament that is currently underway. Another term sometimes used for running tournaments is "Ongoing". A result is enough to complete a match, but a score can be added to represent the in-game points or number of games won. The score can also be used to calculate the result of a match. The seed is a preliminary ranking, used for the placement of the participants. It may come from a global ranking (like ATP ranking in tennis), previous competitions or a previous stage in the same tournament. Seeding participants is the action of attributing a seed to each participant, following a set of criteria. On Toornament, it is achieved in the placement section. The simple stage represents a stage with one or several matches. There is only one group and one round. There is no relation between the matches. A single elimination stage is a bracket in which competitors are eliminated after one loss. Only the winners continue to progress in the bracket until there is only one winner. The size of a stage is the number of participants that will play in said stage. The value is used to generate the matches, and as such, any change of size will result in the stage (and all its matches) being reset to accommodate the new size. A stage is a major step in a tournament. Its purpose is to arrange and organize the competition for some or all of the participants following a specific and standardized method, depending on the stage type. Each type of stage has its own method to arrange matches between participants. A stream is a live video for people to follow an event. You may add streams to your tournament, for your viewers to follow the competition, and link those streams to specific matches. The structure is the general term for a tournament format (stages, match configuration etc.) It's the direct application of the organizer's ruleset regarding the organization of the matches. A swiss stage is a stage in which participants play against opponents closest to their skill level, based on their previous results. Looks a bit like a league, but each participant does not play all other participants, reducing the duration. The threshold is an advanced feature meant to alter a bracket structure to qualify more than one participant. The tiebreakers are a mean to break the ties in ranking if two participants have the same amount of points. A tournament is a competition involving participants (either players or teams), on a single discipline. A winner is determined after all matches are played. Is said of a tournament that has not started yet. You can add videos to your matches to display replays, highlights and bonuses, a bit like how you add a stream. The widgets are an embeddable tool for you to easily display your tournament information on any web page.